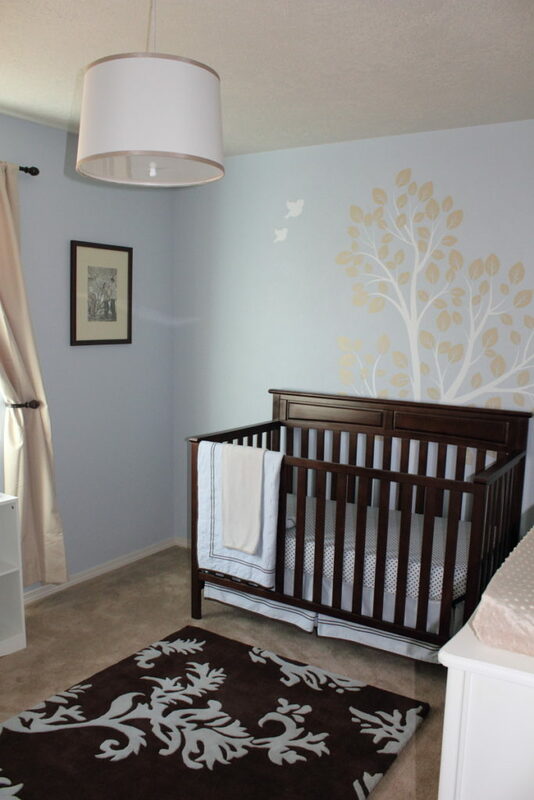 A nursery for our first born son, Noa Michael. I wanted something chic, clean, simple and calm. I knew I did not want any "theme" like trucks, frogs, ocean, jungle, or cartoon characters. Classic with a little modern flair. I knew I wanted simple, classic bedding. I was surprised how hard it was to find crib bedding for a boy without any animals or trucks or cars, etc. on it. I found the crib bedding from Pottery Barn Kids (on sale!). Crib, bookshelf, lamp, chair, curtain rod and silver wall frames are from Target. Wall shelves and brown wall frames from Hobby Lobby. Overhead lighting pendant from Restoration Harware Baby. Wood letters from Pottery Barn Kids. For artwork, I used sepia family photos. I also cut out a couple of color drawings from a Peter Rabbit book and got them matted and framed. The white dresser. My grandmother-in-law found it at an estate sale. I had it repaired and painted and chose new drawer-pulls for it. It came out beautifully. It looks like a $500 dresser from Restoration Hardware Baby! The tree wall decal. I picked the neutral colors of the tree. I was quite a undertaking to put it up, but it worked well and looks amazing. Pick a color palette and stick to it. Start with the crib bedding and work from there. I found the blue and brown bedding first, so I established my color palate around blue and brown. My color pallette was baby blue, chocolate brown, cream and white. Use your bedding to pick a coordinating wall color. Since I chose blue for the walls, I chose neutral colors of creama nd white for the curtians, wall decal and the artwork. Pick a metal finish for drawer pulls, lamps and frames (I chose brushed nickle). Mix painted furniture with wood-finished furniture. I chose two furniture items that were painted white and two furniture items with a dark wood finish (espresso). Very relaxing room with warm, soft and neutral colors. I like your tree wall decal because it’s lovely in a very subtle kind of way,it doesn’t yell for attention. I never really thought that you could mix blue and earth colors so beautifully. Thanks for sharing this room with us!